Grammy Awards night is a big one for artists, but it may be an even bigger night for 34 couples who will be married during the live show. Macklemore & Ryan Lewis are always doing new and innovative things, and what they’re doing at this year’s Grammy Awards will be no different. The duo will be performing their song “Same Love” during the ceremony, and there will be another ceremony happening at the same time. According to The New York Times, 34 couples will be married while Macklemore & Ryan Lewis are onstage. “Same Love” promotes LGBT rights, but gay couples are not the only ones who will be married at the Grammys. The couples will be gay, straight, old, young and of all races. Even better, Madonna will be joining in on the performance, and Queen Latifah will officiate the weddings. Queen Latifah was recently deputized in Los Angeles County, and she will also sign the 34 marriage certificates. The Grammys like to address the social issues of the day, and the producers have said that they know there could be some pushback this time. “I expect that people with all kinds of opinions might voice them, and that’s healthy,” Neil Portnow, the president of the National Academy of Recording Arts and Sciences, told The New York Times. The weddings aren’t a last-minute idea. Grammy producer Ken Ehrlich said the idea came from the wedding proposals that Macklemore and Lewis host at many of their shows. The plan was put into place, and the couples were found. The weddings will also be personal for Ryan Lewis — one of the people getting married is his sister Laura. She will be marrying her longtime fiancé, Alex. 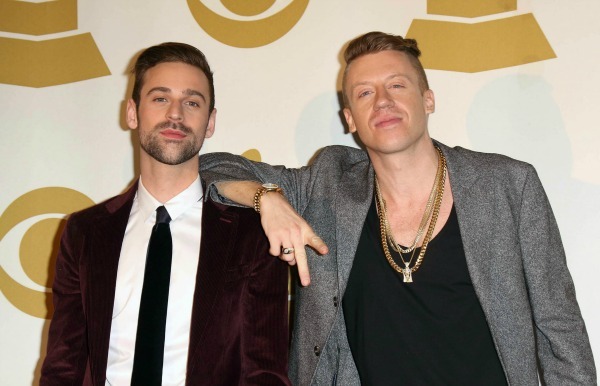 Macklemore & Ryan Lewis are nominated for seven Grammys, and their song “Same Love” is nominated for Song of the Year.